There are many women of faith have gone in prayer and asked “God where is my Boaz?”. There are many churches that have preached to single women to continue waiting for your Boaz. Yet despite all of your efforts, Boaz has not come, and frustration has taken his place. This can seem so unfair, but maybe there is a very good reason this blessing has been delayed. What could possibly be hindering the process? What could you, as a woman of God, be overlooking while you continue to wait on your Boaz? Life can be tough, and most of us (if not all) have felt its wrath. Pain and disappointment can cause even the strongest of people to go hide in their corner where it’s safer. Well that is exactly what some of you have done and it has created more bad than good. You have built up walls to protect yourself, but it’s those same walls that are blocking your blessings. Those walls restrict love from fully flowing in and out of you, but true love makes us vulnerable, and that simply scares you to death. If everyone or everything else is the problem, then how will you ever see the need to improve. You have embraced the idea that you are all that you need to be, but the reality may be that you have yet to truly scratch the surface. You are still a great woman, and you deserve a great love. Yet, that doesn’t mean you don’t have areas in your life that need correction. We all have room for improvement, and sometimes it will take making significant progress before you can receive what is truly best for you. You know God, you praise God, but that doesn’t always mean you trust God. You may hand over control in many areas of your life, but when it comes to dating and relationships, you essentially keep at least one hand (if not both) on the situation. God doesn’t need your help, he needs your obedience. You perception of things can never trump his knowledge of everything. It can be very difficult at times to embrace what is within your spirit when what your eyes and ears receive are giving you something completely different to consider. Yet. if you continue to try to work only within your logic, you might as well tell God his services are not needed. There is nothing wrong with you wanting your Boaz, but there is also nothing wrong with you being single. This is an opportunity to grow and love yourself in a way that will attract all the things you need and truly desire. Your time will come, but that is only if you are willing to put in the necessary work. That requires tapping into God’s guidance and learning what your personal journey consists of. 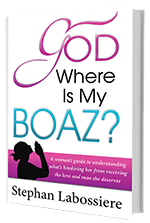 To assist you on that walk, check out the book God Where Is My Boaz. It will help you take a deeper look within and understand what obstacles may be hindering you from getting what you deserve. No more waiting on your Boaz, time to prepare for him, and truly become the woman God created you to be.